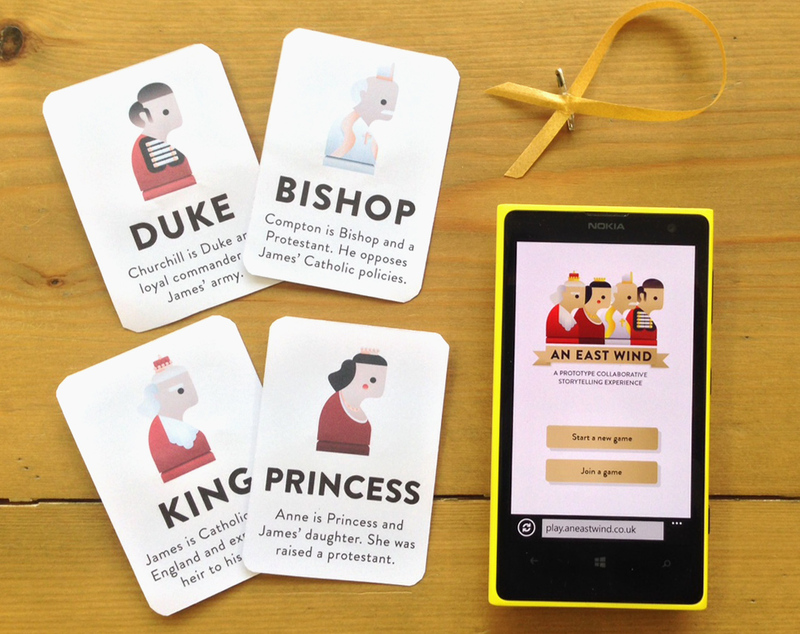 Earlier in the year we were selected to develop a prototype for the Lost Palaces commission by Historic Royal Palaces. 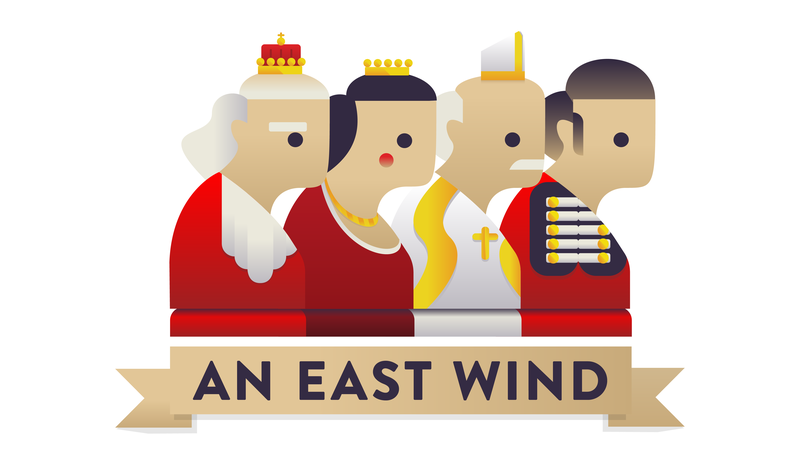 Our project, called An East Wind, was an adventure for groups where each player followed a specific character from the Glorious Revolution (the events that led to William of Orange invading England and taking the throne from James II). 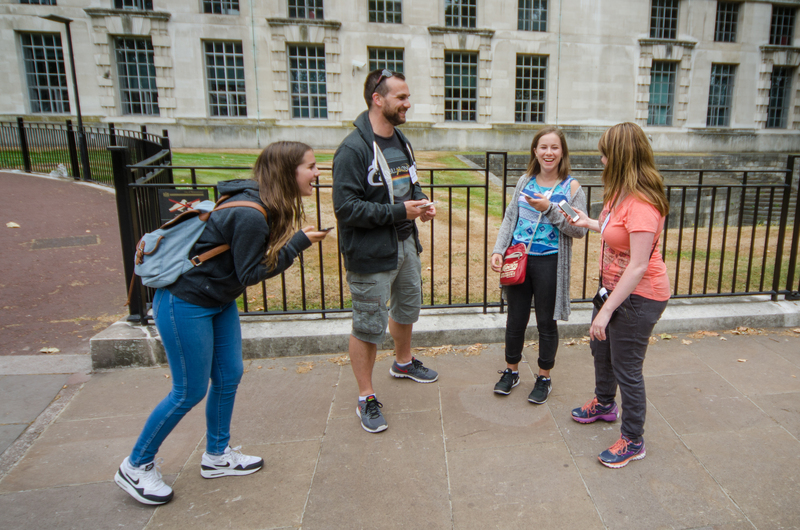 Told on-site at the now lost Palaces of Whitehall, each character saw events unfold from a different perspective. Some of what they were told was to be shared whilst some was to be kept private. At different points players would be prompted to make decisions, knowing that others were working on their own agenda. We were inspired in part by games like Resistance, a Mafia derivative described by BoardGameGeek as “a party game of social deduction’. In Resistance, collaborative storytelling and betrayal are closely linked, asking you to work together to complete tasks, whilst either convincing the other players of your innocence through hard work and loyal service, or creating convoluted scenarios to weed out spies and defeat the Imperialists. The betrayal mechanic really suits the historic material of the Glorious Revolution. James II’s story is full of confused motives and opposing forces, from family and politics, to religion and pride. Though many players might already know how the story ends, we took Hilary Mantel’s approach of writing history in the present tense, or as Martin Belam says, creating “a narrative that you can see backwards, but the protagonists can’t”. It becomes not who will be betrayed, so much as under what circumstances. Luckily for us there is some ambiguity in exactly when the Protestant Bishops, James’ Commander in Chief and his sister Anne all defected. In developing the digital element of the interaction, we often referenced the superb Spaceteam, ‘a collaborative shouting game for phones and tablets’. Spaceteam sits in a surprisingly small genre, that of the local network (shouting distance) multiplayer smartphone game. You are the crew of a spaceship undergoing various states of cosmic duress. Your task is to maintain the vessel using the instrument panel displayed on your smartphone. During the game you are given a queue of orders relating to yours and other players instruments, the later must be conveyed across the meat space in a timely fashion before the ship disintegrates. Though more joyously chaotic than An East Wind, the idea of a story pieced together in a few vocalised fragments makes for great intrigue during the game, and lengthy conversations after. Spaceteam also handles synchronisation really well, over wifi or bluetooth. After too many weeks trying to get four player SMS to arrive at the same time, we moved to a web app format. Though it was a shame to lose the intimacy of SMS, the web app gave us a huge jump in immediacy and precision. By the end of the run, with this jump in performance, it was very satisfying having the script of a four person narrative being generated dynamically and acted out directly. We hope that by telling a historic story through the words and actions of other players, asking them to translate and perform, An East Wind creates an interesting relationship with the material, offering a new way to play in the lost historic details.